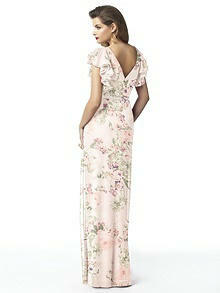 Present a sophisticated and stylish outlook with this elegant full-length lux chiffon bridesmaid dress. Flutter sleeves sync with a draped wrap v-neckline and pleated detailing in the front. Enjoy a lux chiffon covered silver sequin belt that delivers perfect proportioning.